Follow the weather forecast to schedule the tour on a sunny day. We are comparing Sagrada Familia & Gaudi Guided Tour Prices from leading ticket suppliers and Try to find you Cheap tickets prices on the market. An insightful tour that introduces several structures that immortalized Antoni Gaudi as one of the greatest architects in history. A story about the architect himself and the city of Barcelona. A tour that introduces the Catalan Modernist art movement. A chance to visit the most visited attractions of Barcelona without waiting in long lines to enter. The tour explains well everything you need to know about the most emblematic places in Barcelona, even in Spain. Joining the guided tour is a must for everyone craving to know everything about Gaudi and his architectural masterpieces famous all over the world. The tour reveals strong symbolism of every detail that might seem random on Gaudi's structures. The tour is especially recommended for devotees of art, architecture and travelers who are in the Catalan capital for the first time. Your Experience With Sagrada Familia & Gaudi Guided Tour? Take an exterior tour of the Casa Batllo, one of the most famous Gaudi's residential masterpieces, and, if you choose the option, tour the structure from the inside. Admire the design of the Casa Mila, the other famous apartment building designed by Gaudi. Explore the Park Guell, featuring an extraordinary architecture and views of the city, as you skip long lines at the entrance. Learn about the Sagrada Familia, the religious masterpiece of Gaudi in Barcelona, on an insightful tour that, depending on the selected option, includes a visit to its towers. 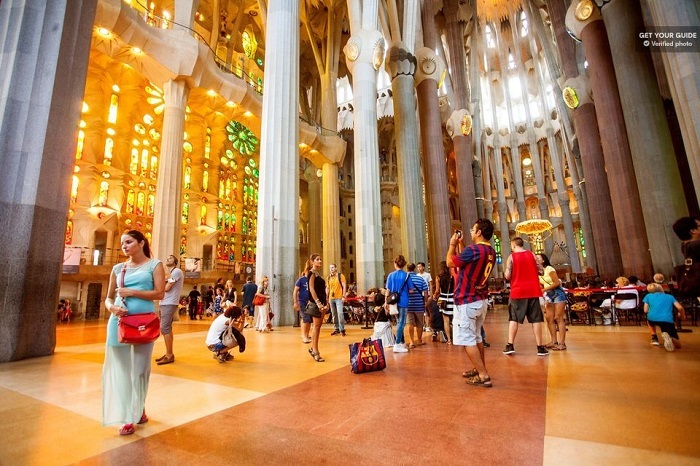 What Sagrada Familia & Gaudi Guided Tour Includes? Coach ride between points of interest. Knowledgeable and passionate tour guide. Priority entries to the Sagrada Familia Basilica and the Park Guell. An optional visit to the Casa Batllo before its official opening hours. Gaudi was devoted to the city and religion in particular, which becomes obvious if you know where to look as you visit the Park Guell. A tour of the Casa Batllo, if selected, takes place before the attraction opens its doors to regular visitors. There is an elevator taking visitors to the towers of the Sagrada Familia, but you would need to take the stairs to climb down. Travelers Reviews about Sagrada Familia & Gaudi Guided Tour? People that took the tour commend vast knowledge of their guides. Their comments indicate that taking a tour was the right thing to do in terms of revealing exceptional features of the related attractions. Furthermore, they found the knowledge they gained interesting and useful for the rest of their stay in Barcelona. Travelers spoke highly about the language skills of their tour guides. People that joined the tour underline the great importance of the priority entry to the Sagrada Familia and Park Guell. Because of the nature of the guided tour (a lot of walking and climbing), this tour isn't suitable for visitors with disabilities. To take part in the tour, you can present either electronic or paper voucher. You receive a full refund for a timely cancellation. You will need to leave bags in lockers (€1) to visit the towers of the Sagrada Familia. The access to the towers may be restricted if the weather is unfavorable. Put on footwear suitable for walking.